The incremental rate at which Nigerian students are failing JAMB has now become a major trending topic on every social media platform across the country and as we draw nearer to this year’s UTME exam, one can only say that majority of admission seekers are again headed for failure. More so, since the introduction of the Computer Based Training (CBT) method, the hopes of many admission seekers have been dashed due to several reasons, one of which is the major problem I intend to discuss below. Take for instance the statistics of last year’s results by the JAMB Registrar, Prof. Dibu Ojerinde. According to statistics, the scoring of students who have passed UTME JAMB in 2016 was the lowest of all! His declaration at a news conference in Abuja was that about 1,048,314 out of the 1,503,931 candidates who participated in 2016 Unified Tertiary Matriculation Examination, UTME, by the Joint Admissions and Matriculation Board, JAMB, passed the examination; Majority of which scored below 200, while just three (3) candidates scored the highest with over 300 marks. Without further delay, I will go straight to the point. 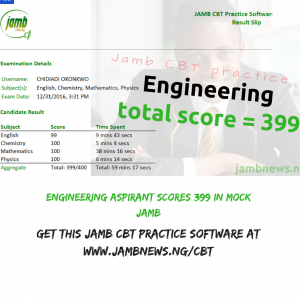 The reason why Most People Failed the JAMB CBT Exam last year and How to avoid it!!! A lot of Brilliant and Intelligent Nigerian students are computer illiterates and this is the major problem for their poor performance. To be fair it’s totally not the fault of you students as the government hasn’t provided the essential training platform to cater for most of you, leaving a reasonable percentage of you guys handicapped and unprepared for the CBT Exam despite your high level of academic intelligence. Only those who are fortunate to have a PC or Laptop in their home courtesy of a Brother or an Uncle tend to have the luxury of perfecting their skills and can boldly walk into the exam centre with their head up high. Nevertheless, it’s pointless blaming the Nigerian government for your failure as it will yield no positive result just like those who took to the streets of Lagos to protest after last year’s CBT exam. We are already in the Global age where everything is done on a computer and just like the JAMB CBT exam there are other Computer based tests out there. So it’s highly recommended you get one. You will need it soon enough, so why not just get one now? Why wait on the Nigerian government? Even if you can’t afford a laptop, there are portable notebook systems within the price range of (#14000 – #25000) which will do the same job as Laptops and also help improve your computer skills before the Exam day. It is strongly required of you to do so if you are really determined to excel.